These exotic seeds are excellent for trying out new species of majestic trees, unusual flowers, exotic fruits, foliage, or herbs. Only one dollar per packet for any kind of seeds. Each packet comes with color photo and growing instructions. To order, please send list of seeds and payment (total for seeds plus $5 shipping for North America, or $8 shipping for International) to perry@FloraExotica.ca via PayPal at https://www.paypal.com/ . Seeds will be shipped within a few weeks after payment is received. 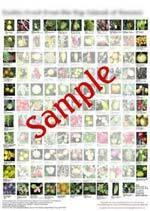 We are working on listing all available seeds on this page for your convenience. For now, please go to the appropriate page (Exotic Flowers, Exotic Foliage, Exotic Fruits, or Exotic Vegetables) and note those items with the notation 'Seeds $1' in the Price column. Sorry for the inconvenience.